This article is a short summary of Mario's Tennis. 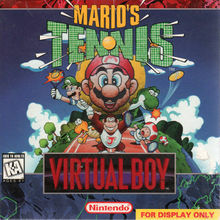 Mario's Tennis is a Super Mario sports game released for the Virtual Boy, and a launch title for the system. The game was also released in a bundle with the system. Smashing tennis action with incredible depth on a realistic 3-D court! Experience the ultimate Virtual Boy sports game in either singles or doubles matches! Lob, volley or send an overhead smash to crush your opponent. Choose one of seven characters, each with their own strengths and weaknesses. Enter a 3 round tournament to try to win the cup! Actual game play is 3-D! This page was last edited on 9 September 2016, at 00:11.